Hurricane Florence slammed into the East Coast, knocking out power in parts of the Carolinas, dumping torrential rains and inundating several areas with floodwater. 17: The number of fatalities as of the afternoon of Sunday. 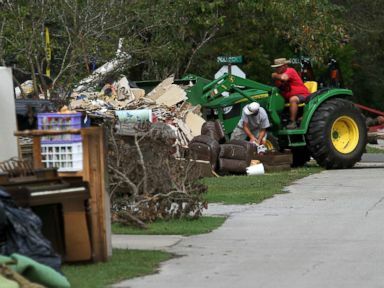 A 41-year-old mother and her 7-month-old son were killed in Wilmington, North Carolina, when a tree fell on their home, officials said. The woman's husband was injured in the incident and taken to a nearby hospital, according to police. A 77-year-old man in Lenoir County, North Carolina, fell and died from "a cardiac event" while checking on dogs outside during the storm, officials said. An 81-year-old man died in Wayne County when he fell and struck his head while packing to evacuate, officials said. A 68-year-old man died when he was electrocuted while plugging in a generator in Lenoir County. A husband and wife also died in a house fire in Cumberland County, officials said. In South Carolina, a woman was killed when she struck a tree while driving, and a couple died from carbon monoxide poisoning from a generator being operated inside their home, officials said. 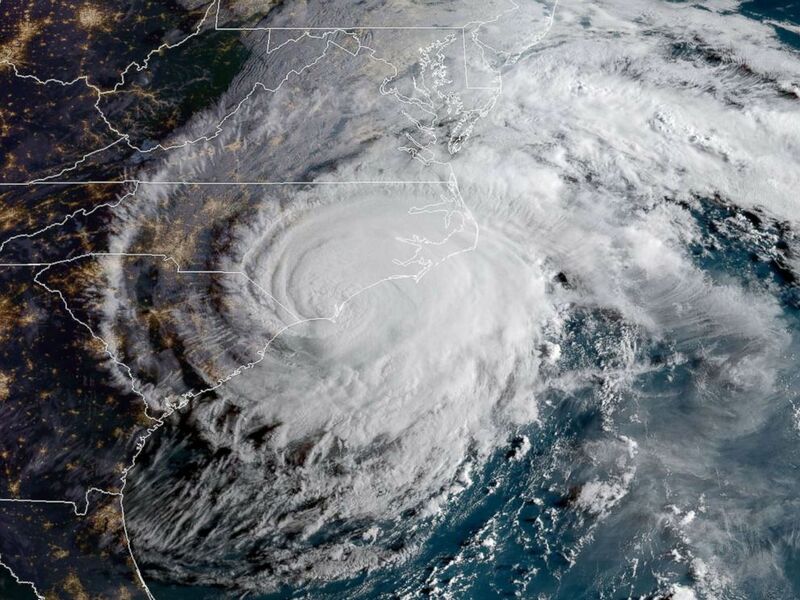 This NOAA/RAMMB satellite image taken Sept. 14, 2018 at 8:00 am EST shows Hurricane Florence making landfall on US east coast. 100: The number of people who needed to be rescued in flooded New Bern, North Carolina, on Saturday morning. "We have three rescue teams who are working around the clock to get into communities to retrieve people," the city said in a statement. New Bern resident George Zaytoun, who chose not to heed evacuation warnings and was trapped inside his home, told "Good Morning America," on Friday, "It’s like a bomb has gone off." “Everything around us is underwater," he said. Union Point Park is flooded with rising water from the Neuse and Trent Rivers in New Bern, N.C. Sept. 13, 2018. 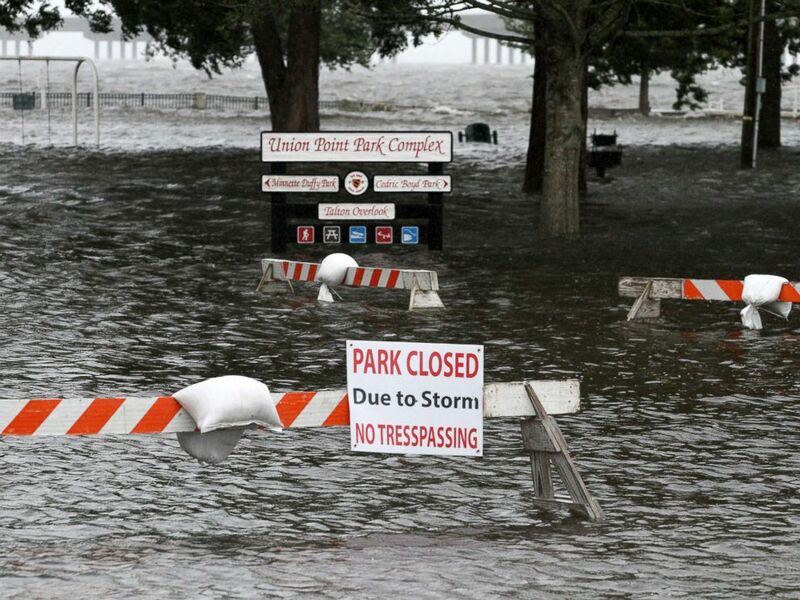 Union Point Park is flooded with rising water from the Neuse and Trent Rivers in New Bern, N.C., Sept. 13, 2018. 65: Number of trees blown across roads in Raleigh, North Carolina, Saturday morning. 33.89 inches: As of Sunday, Swansboro, North Carolina, had received an unofficial total of 33.89 inches of rainfall, breaking the all-time rain record for North Carolina of 24.06 set in 1999 during Hurricane Floyd. 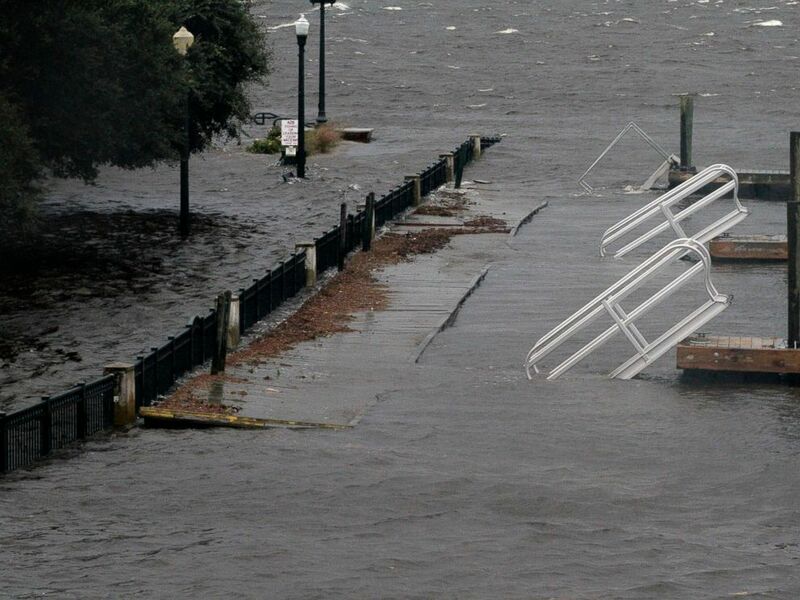 Wilmington, North Carolina, had received 23.59 inches of rain, a record for a single weather event. 592,370: Number of customers without power in North Carolina on Sunday. 27,456: Number of customers without power in South Carolina on Sunday. 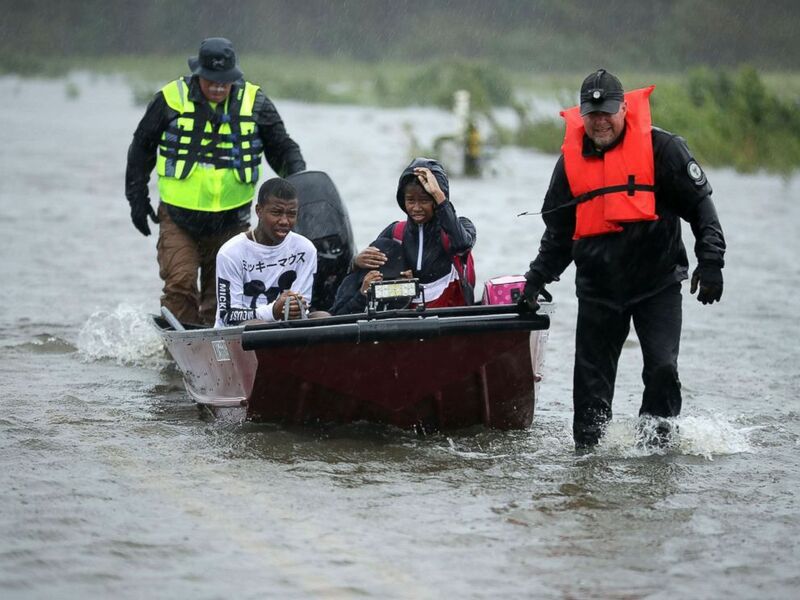 1 million: Up to 1 million people have evacuated their North Carolina homes, Gov. Cooper said Friday. 20,000: More than 20,000 people in six states -- North Carolina, South Carolina, Virginia, Georgia, Maryland and Tennessee -- took shelter in 206 Red Cross and community shelters on Thursday. 730,000: The number of blankets available for evacuees. Six-thousand cots and 6 million meals have also been provided. 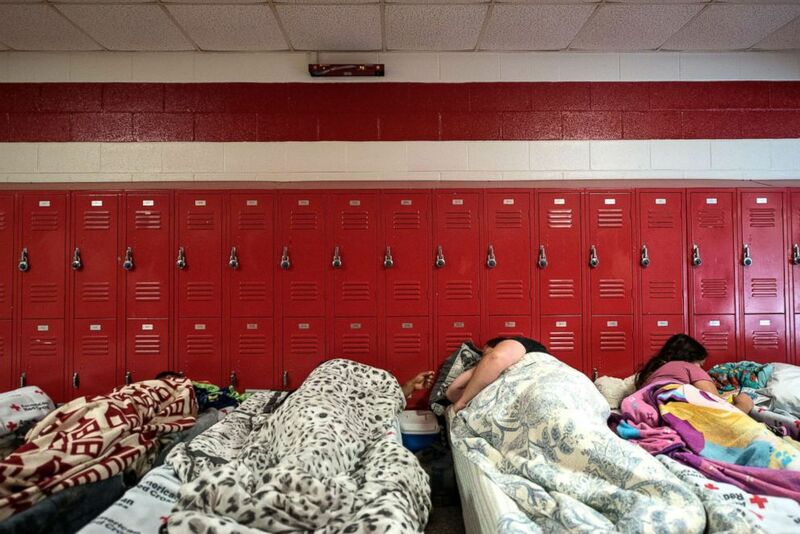 People and pets evacuate ahead of the forecasted landfall of Hurricane Florence and seek shelter at Burgaw Middle School in Burgaw, N.C., on Sept. 2018. "People do not live and survive to tell the tale about what their experience is like with storm surge," FEMA administrator Brock Long told "GMA." 40 inches: Rainfall could reach this point. 13: Number of nuclear reactors the Nuclear Regulatory Commission is monitoring near Florence's path. 19: Number of states sending teams to help North Carolina with Florence. ABC News' Rachel Katz, Morgan Winsor, Brendan Rand and Dom Proto contributed to this report.